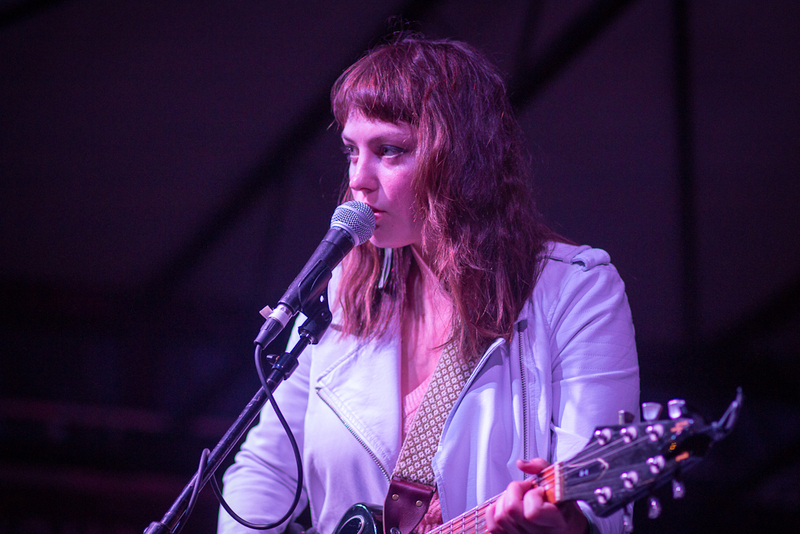 The first time I saw Angel Olsen live was at Hopscotch in an intimate theatre setting. You could have heard a pin drop, or a phone vibrate the entire show. I was already a fan, but that night and that setting, turned me into something more close to a fanatic. Last night at Mohawk was an entirely different experience. Olsen, who now lives in Asheville, NC, was admittedly on the tipsy side as she headlined a stage full of incredible acts including Steve Gunn, Ryley Walker, Speedy Ortiz, Waxahatchee, and Torres. It’s an odd mix of styles, but a lineup that seemed to overlap fans more than most showcases at SXSW. Her soundcheck led straight into her performance, as she was relaxed and playful with the crowd, still finding a way to be totally into her music. After her first song she apologized for getting so angry during the final verses. It lead me to believe that writing and performing her songs might be the hardest part, but not in a stage fright kind of way. She repeated it a couple of times, but she said the stage isn’t the hard part for her. It was interesting to see her beside artists like Steve Gunn and Ryley Walker whose main weapons of performance is their guitar playing ability. Their voices are totally secondary because they’re phenomenal guitarists, but to see them paired beside Angel Olsen was a treat. Olsen’s voice is her primary outlet, blanketing her guitar parts with highs and lows, and hums from soft to loud. It’s just as mesmerizing to watch her control her voice like she does as it is to watch Gunn finger pick through intricate guitar parts with relative ease. Torres was in an unfortunate spot sandwiched between such musicians. There were some rough patches and down moments that were out of their control, but Mackenzie Scott and company still held their own. I’ve been digging their new single “Strange Hellos” and it was great live, as were some of the other songs, but as far as pure ability goes they were no match for Olsen or the two guitarists prior. Then you have Waxahatchee and Speedy Ortiz. The crowd for the most part last night was great considering that they were mostly fueled by Lone Star and that it was at Mohawk, a big loud outdoor venue. Both Olsen and Waxahatchee took the stage solo and commanded the attention of the crowd. Before the show I was talking with someone in the front row about Waxahatchee and how much I loved her sister’s band Swearin’. They’re totally different styles, but their voices together are perfect. Surprise, Waxahatchee singer songwriter Katie Crutchfield brought her sister Allison out for a couple of songs, leading some to note the reunion of their old band P.S. Elliot. Waxahatchee was perfect, playing a mix of new and old songs, and holding the crowd in check. There was one cat call from the crowd which in turn received a scowl from Crutchfield. It made me feel great inside. Speedy Ortiz has been on everyone’s list as one of the bands to see at SXSW 2015, and I want to be on that bandwagon, but last nights performance didn’t get me there. Sure, they were great, they really were, but the crowd just wasn’t into it. Maybe it was because they’re typically high energy set was out of place for the lineup, but most of the new tunes fell flat. I saw them at a day party last year and their guitarist was going crazy, standing on chairs, smashing his guitar into everything in site and it was incredible. None of that energy was there last night, and their guitarist from last year was not in the band. New guitarist got the job done, but now they’re missing some of the energy that I previously saw and loved. Also seeing Residual Kid earlier in the day made me antsy to see some more craziness on stage. More on Residual Kid and the day party bands later. On to day 2.